Red nativity. Hand-Painted Gourd Christmas Ornament by artist Sandy Short www.handpaintedgourds.com. Hand Painted Gourd by artist Sandy Short www.handpaintedgourds.com. This design is signed and titled on the bottom of the art piece. Makes a great ornament, gift, teacher gift, nature lover, etc. Unusual art piece. It makes a great gift! *Ornament size: 2 3/4 inches tall. *Artist choice size: 3 inches tall. *Masterpiece size: 3 1/2 inches tall. ***All gourds are natural so please note sizes and shapes vary. This design is painted on a Wild Buffalo Gourd found in the desert of New Mexico. I was featured in "New Mexico Magazine". This gourd is an original one-of-a-kind art piece. They make great thank you gifts, pet sitter gifts, an unusual gift for a hostess, wedding parties, birthdays, parents love them as special teacher gifts, special boss or secretary gift, or your own special ornament for the tree. I wholesale my art so if you or someone you know would like to sell my work at a gift shop, gallery or store, please contact me for more information. Check back often as I will be adding new designs all the time. Thank you for considering my art and I look forward to hearing from you! Santuario de Chimayo Mission, NM. Hand-Painted Gourd Christmas Ornament by artist Sandy Short www.handpaintedgourds.com. Original artwork. 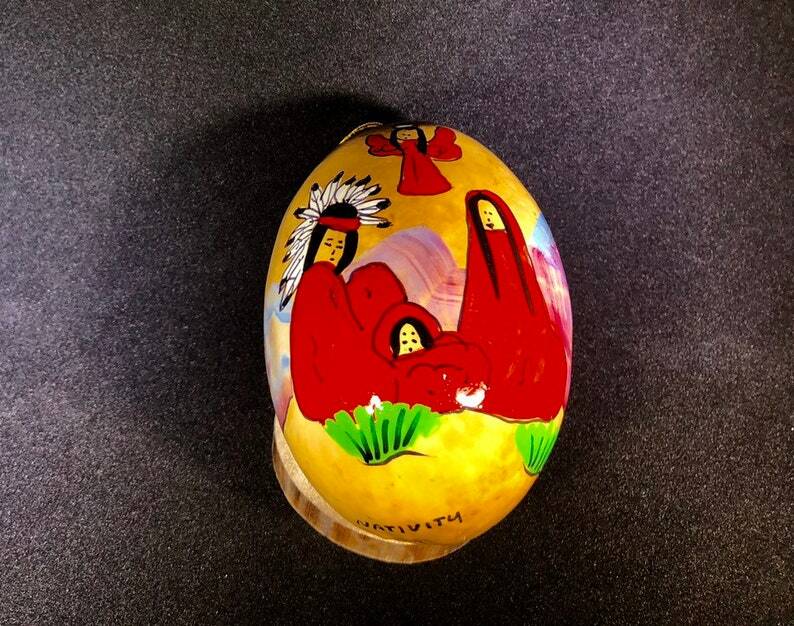 Mesa Verde, Colorado ornament Hand painted gourd ornament, Hand-Painted Gourd Christmas Ornament by artist Sandy Short. Hummingbird and cactus Hand–painted Gourd Christmas Ornament by artist Sandy Short www.handpaintedgourds.com. Original artwork. Blue pow wow Hand–painted Gourd Christmas Ornament by artist Sandy Short www.handpaintedgourds.com. Original artwork. Light weight. Turquoise nativity. Hand-Painted Gourd Christmas Ornament by artist Sandy Short www.handpaintedgourds.com. Teal nativity. Hand-Painted Gourd Christmas Ornament by artist Sandy Short www.handpaintedgourds.com. Love love love! Arrived when expected and the quality was better than I had hoped. The finish is glossy and measures 2.5" x 3.5". Sandy graciously added some personalization which was very appreciated. A unique gift / ornament to commemorate my son's first year in Albuquerque. Appreciate artists’ efforts to make these so beautiful and meaningful - received very quickly even during holiday rush. Please make make your payment promptly and I will send your art as soon as your payment has been cleared. Do you have a gift shop or gallery who would like to sell my popular artwork? Wholesale inquiries welcome! Pink angel. Hand-Painted Gourd Christmas Ornament by artist Sandy Short www.handpaintedgourds.com. Bluebird maiden. Hand-Painted Gourd Christmas Ornament by artist Sandy Short www.handpaintedgourds.com. Original artwork. Taos Pueblo -Hand-Painted Gourd Christmas Ornament by artist Sandy Short www.handpaintedgourds.com. Original artwork. Kokopelli flute player. Hand-Painted Gourd Christmas Ornament by artist Sandy Short www.handpaintedgourds.com. Original artwork. Pueblo sunset. Hand-Painted Gourd Christmas Ornament by artist Sandy Short www.handpaintedgourds.com. Original artwork. Gateway to the west. Hand-Painted Gourd Christmas Ornament by artist Sandy Short www.handpaintedgourds.com. Original artwork.